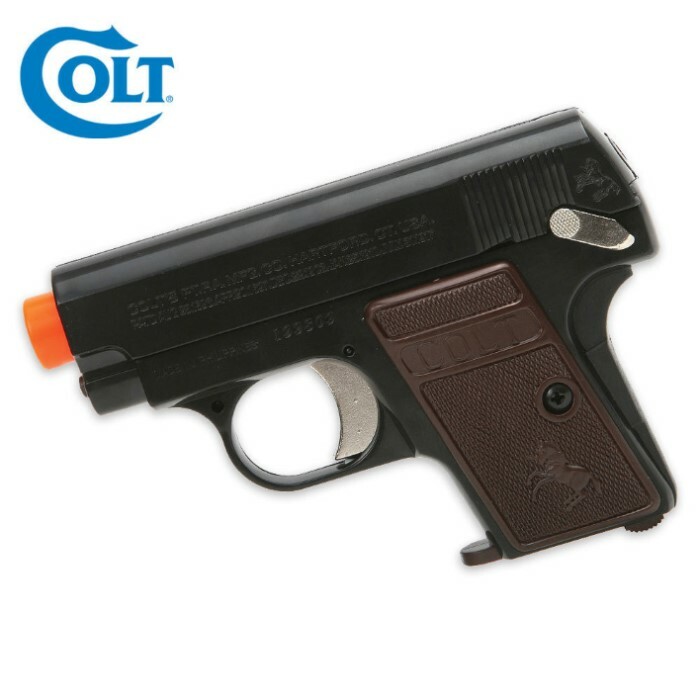 The compact Colt .25 pocket pistol replica features a metal body and is a reliable skirmishing gun that packs a punch. This realistic gun is an authentic replica of the Colt 25 firearm, and features spring-powered firing, a shot velocity of 181 fps (using .20g BBs), and hop-up for excellent performance in the field. This is an ideal gun for airsoft enthusiasts who need a skirmish-ready gun during periods of re-loading. Orange tips are required by Federal law. Do not remove the orange tip found on your airsoft gun. I got this exact gun for Christmas in a huge bag of bb's, I shot it that day, and didn't like it. It curved a lot and only hold 7 bullets. If you were just starting out with airsoft it would be ok, but I do not recommend this item. This is a perfect replica of the Colt Model 1908 "Hammerless" .25 Automatic. Except for the plastic construction, it is accurate in appearance right down to the various patent dates stamped on it. At this size and being spring propelled, it's not going to be very long range or terribly accurate, but it is fun and as a collector of replicas, I recommend it highly. 5 Stars. It is a good sidearm. It is pretty small and doesn't have that good accuracy, but is still fun to use.